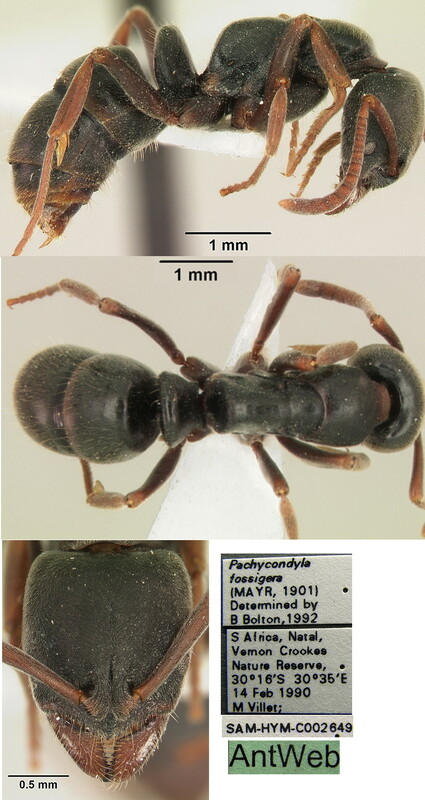 Type location South Africa (Euponera fossigera nov. spec, Mayr, 1901b: 3, worker; in Pachycondyla, Bolton, 1995: 305; status revived Schmidt & Shattuck, 2014: 86); worker only described (see Bolton, 1995) - see below . 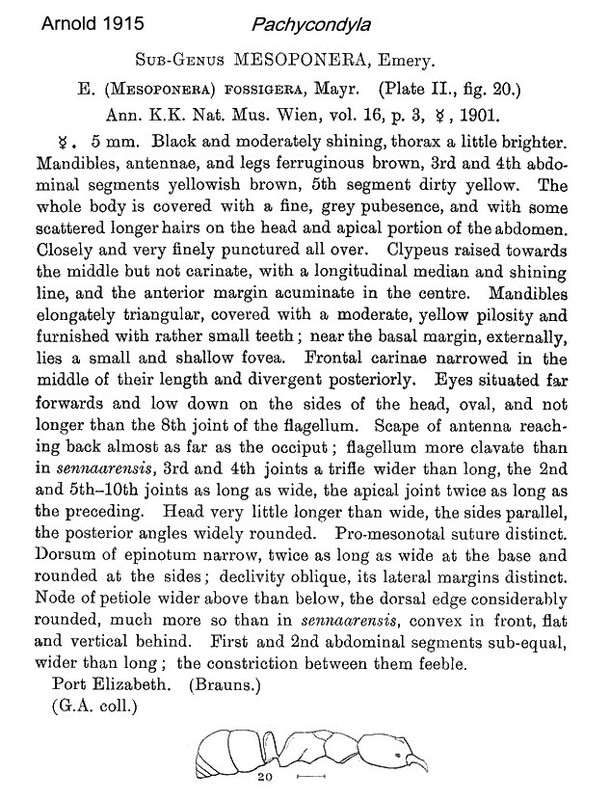 Mayr's (1901b) description is at . 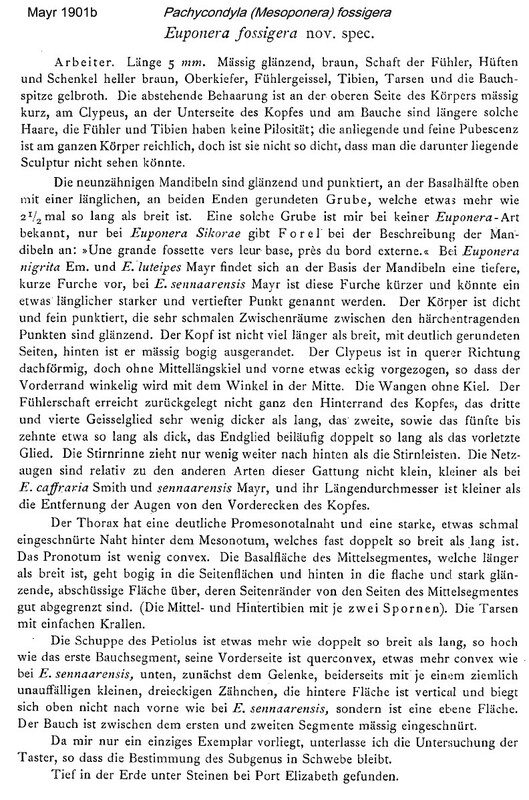 Arnold (1915: 71) gave a translation, as Euponera (Mesoponera) fossigera; this is at . The photomontage of the type worker is collated from http://www.antweb.org/specimen.do?name=casent0915663. Note that this is smaller (assuming the Antweb scale to be correct), HW 1.0 mm, than the two below, the Western Cape one has HW 1.3, and the Natal one HW 1.45. Mayr gave TL 5.0 mm but excluding the mandibles the type appears to be TL ca 4.8 mm. The photomontage is of a specimen from South Africa, Western Cape, Grootvadersbosch N.R. ; collector Peter Hlav醕. The photomontage is of a worker collated from http://www.antweb.org/specimen.do?name=sam-hym-c002649b.